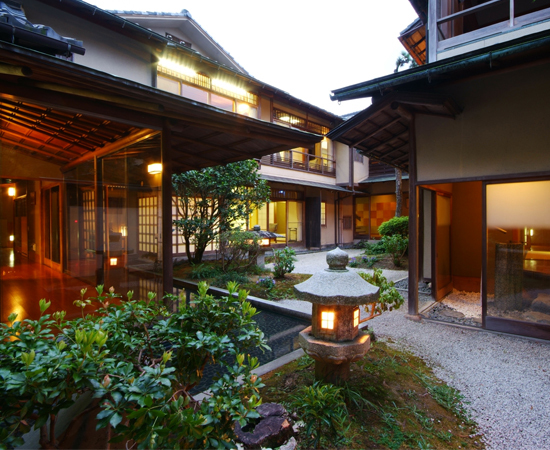 Founded over 150 years ago, Nishimuraya Honkan is the leading lodging at Kinosaki Onsen--a traditional hot springs resort town with a history dating back 1,300 years. The town itself has a reputation for being a hidden gem in Japan's Kansai region, situated within Hyogo prefecture by the Sea of Japan and accessible from both Kyoto and Osaka prefectures. 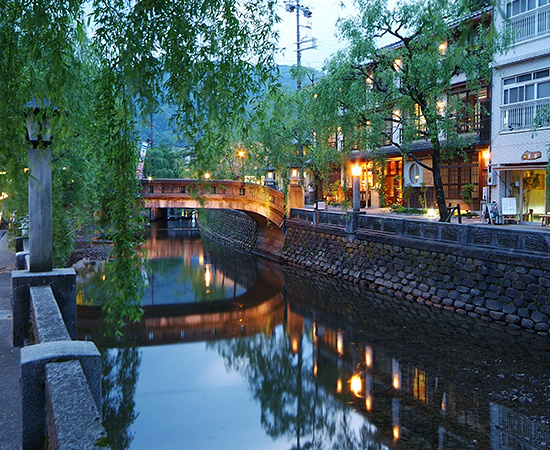 Kinosaki Onsen is compact and can easily be explored by visitors on foot, who roam to and fro between seven famed hot springs open to the public, dressed in lightweight kimono-like garments called "yukata." 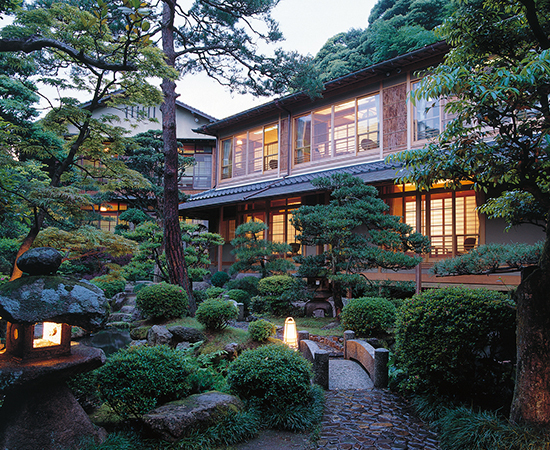 However, as the pinnacle of luxury when it comes to traditional ryokan lodging in Japan, Nishimuraya Honkan specifically serves guests with a taste for the finer things in life--and to serve those who are accustomed to luxury, one must be just as accustomed to luxury oneself--sometimes even moreso. 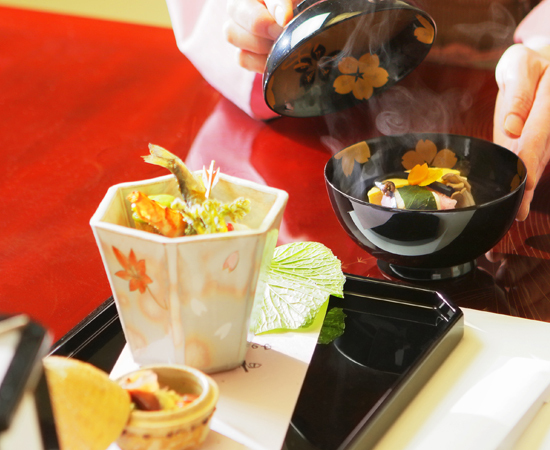 This is how Nishimuraya Honkan's pursuit of elegance in its purest form has defined its mission in delighting the guest. This understanding of the essence of Japanese refinement plays out a hundredfold in each aspect that makes up Nishimuraya. 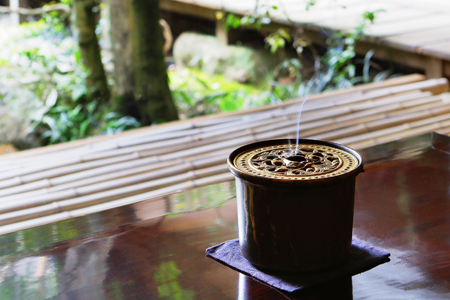 One can immediately discern this attention to fine taste upon passing through the main entrance--a faint, yet pleasing fragrance greets the nostrils--a tastefully blended incense. 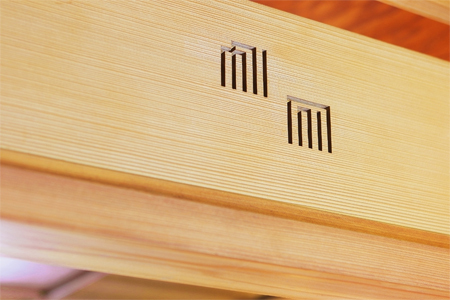 Then upon looking around, one might notice the "genji-mon" symbols engraved on the transom. Those informed about the Japanese art of incense will instantly recognize these symbols as a subtle, playful hint at what was likely passing through the mind: ""Ah, this incense!"" And yet, only a master carpenter and architect could have pulled off this feat--one who truly comprehends the taste of those who appreciate Japan's aesthetic sensibilities. The gate of the Nishimuraya Honkan is registered as an Important Cultural Property of Japan together with the Hiratakan annex building and the main reception hall. Middle: The gate of the Nishimuraya Honkan is registered as an Important Cultural Property of Japan together with the Hiratakan annex building and the main reception hall. Bottom: The courtyard. Rooms facing the courtyard have been designed so that the interior of each room cannot be seen from other rooms. So-called "genji-mon," or Genji crests engraved on a transom. These crests relate to the world's first novel, "The Tale of Genji," and are used in the art of incense. "The guests staying in "Hiragi" originally wanted to stay in a larger room?" "Yes, but as soon as they entered "Hiragi" they liked it so much that they didn't want to change!" 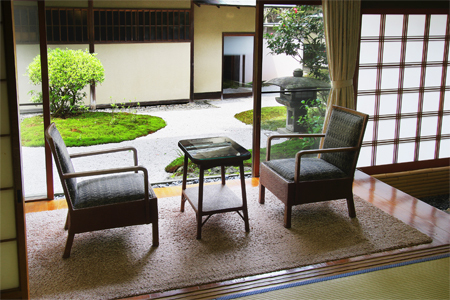 The "Hiragi" room is just eight tatami mats in area and faces the garden. Not just this room, but every room at Nishimuraya Honkan is unique, and none share the same design. So even an eight-mat room has its own charm. Many guests enjoy this "once-in-a-lifetime" encounter with such a special room. The Japanese garden at Nishimuraya Honkan. Looking out from the guest room one feels the balance and harmony of a traditional Japanese painting. Is one looking at a painting, or is one in the painting itself? This peculiar feeling, coupled with the slow passage of time, is comforting. 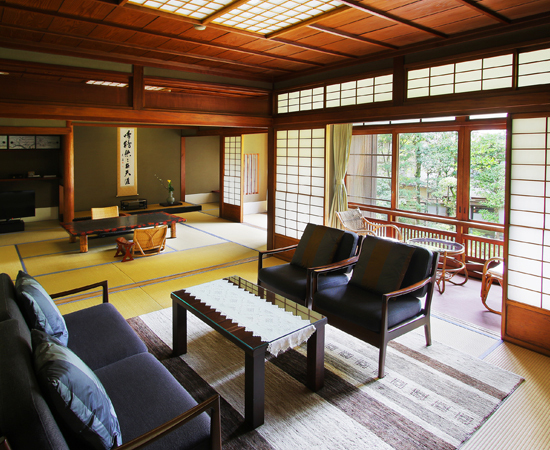 The "Hiragi" room, with an area of 8 tatami mats, is just such a guest room. 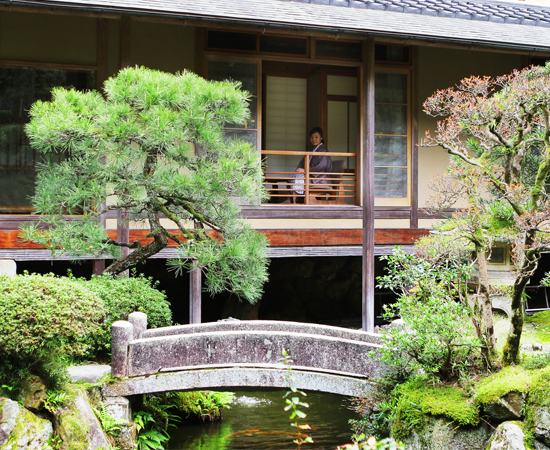 The veranda facing the garden extends over the pond, just as if it were a riverbank. In summer, a gentle breeze blows over the water and into the room. The room and the garden seem to continue beyond the fence. The guest rooms at Nishimuraya Honkan have a depth and breadth which cannot be quantified with a single number. This is the same for guest rooms which do not face the garden. 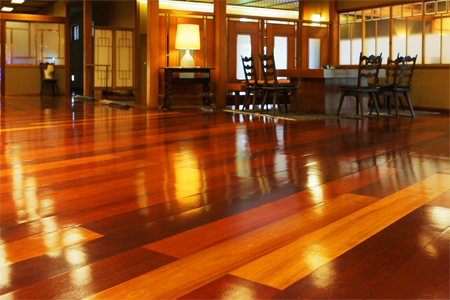 For example, the 8-mat "Korin" room on the second floor. Below the window, one can hear the clear but tentative steps taken with "geta" (traditional Japanese wooden clogs). In cherry blossom season, the view is phenomenal. 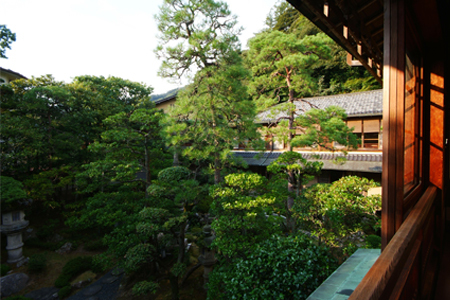 The views of Kinosaki extend into the space within Nishimuraya Honkan. Furthermore, inside the rooms, the elaborate and unique furniture and fittings delight the eye, providing endless enjoyment. 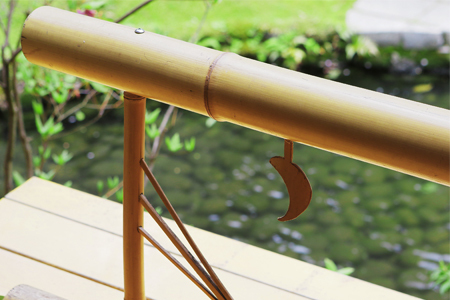 In the "Korin" room, a wooden railing made of a single piece of wood is what the eye first sees. The craftsmen must have put their heart into this maple board, to create this exquisitely carved piece. 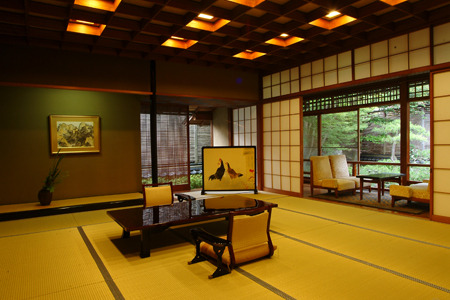 The "Kumoi" room, which is also on the second floor, is marked by a certain playfulness. Once in the entrance, one immediately sees the window adjacent to the "tokonoma" (alcove), which is placed there to gather light from the outside. It floats within the dim room, as if it were a white cloud. With this night-time view and the wide daytime vista extending outside the broad terrace, it is as if two contrasting times live together, reminiscent of Magritte's "Empire of Light." This forms a very strange spatial effect. It is recommended to check in to this room while there is still daylight in order to enjoy this effect. The "Hiragi" room as seen from the garden. A gentle cool breeze blows into the spacious veranda. The veranda of the "Hiragi" room. The lighting is built into the ceiling and the same as used in the guest room. The design evokes a sense of playfulness. The interior of the "Kumoi" room. This space brings day and night together. 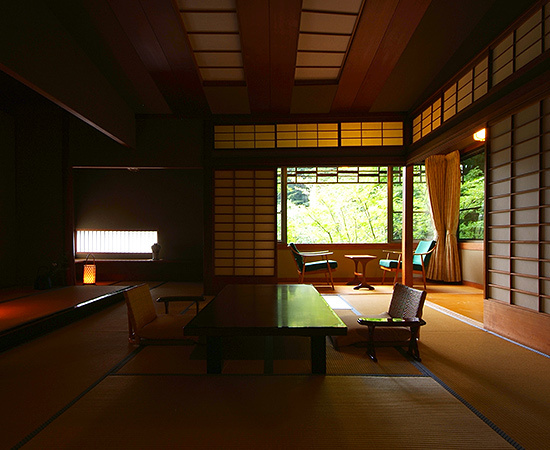 Top: The "Hiragi" room as seen from the garden. A gentle cool breeze blows into the spacious veranda. 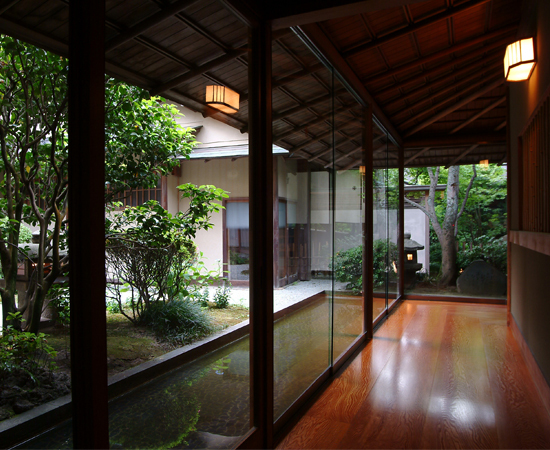 Middle: The veranda of the "Hiragi" room. The lighting is built into the ceiling and the same as used in the guest room. The design evokes a sense of playfulness. Bottom: The interior of the "Kumoi" room. This space brings day and night together. 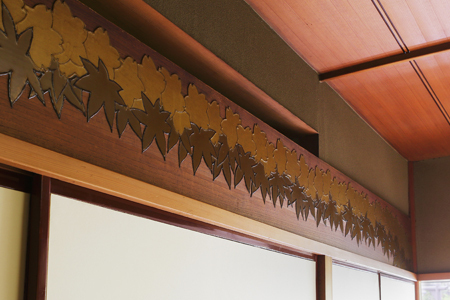 The transom of the "Korin" room features a motif of Japanese maple leaves. Furnishings for each room are selected to match the room's atmosphere. 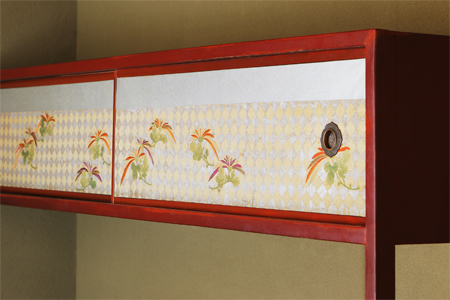 A cupboard's paper sliding door in the "Kumoi" room is depicted here. A closed shelf from the "Korin" room. Watching night descend upon exquisite scenery is one of the quiet thrills that can be enjoyed at this ryokan, from either the lounge or the guest rooms. Time flows ever slowly, and one just needs to surrender to its pace to relax. Unexpectedly, the town of Kinosaki comes to life at this time of day. The clip-clop of "geta," Japanese wooden clogs, begin to proliferate as visitors wander from bathhouse to bathhouse in the vicinity of the willow tree-lined Otani River, which flows through the center of town. 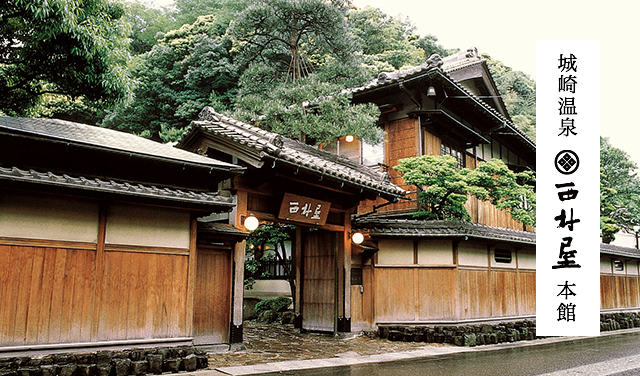 There are seven hot spring bathhouses open to the public in Kinosaki, including Goshono-yu and Ichino-yu. 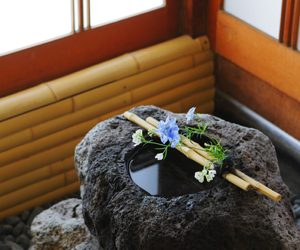 Many of the ryokan in Kinosaki are not equipped with bathing facilities as these public hot springs are not only available to all, but the main draw for those visiting. 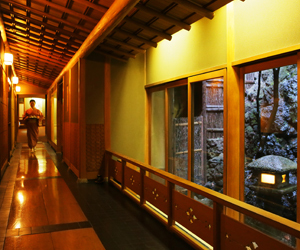 Nishimuraya Honkan has three large indoor communal baths, a rarity for ryokan located in central Kinosaki. This constitutes sort of an eighth spring of Kinosaki, which only Nishimuraya guests can enjoy. One can imagine the hustle and bustle of Kinosaki while relaxing in these exclusive hot springs, or one can let their mind rest at ease after watching Kinosaki's exciting fireworks displays, which are held every evening in summer (certain dates excluded). Time flows ever slowly, and all one needs to do is surrender to it. Fireworks displays are held nightly during the summer vacation (certain dates excluded). 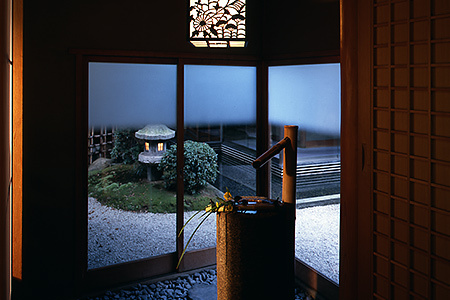 There are three large communal baths at Nishimuraya Honkan, including the Kichino-yu bath shown here. 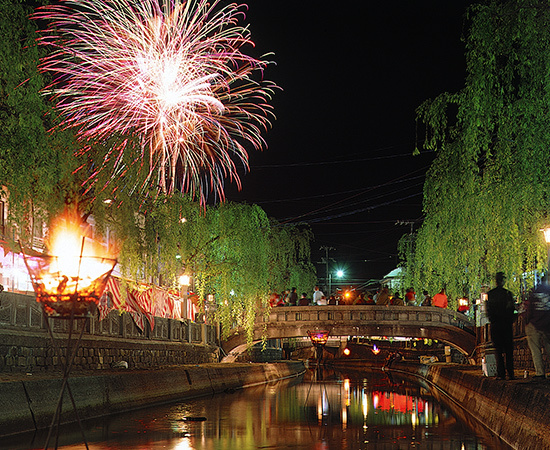 Top: Fireworks displays are held nightly during the summer vacation (certain dates excluded). 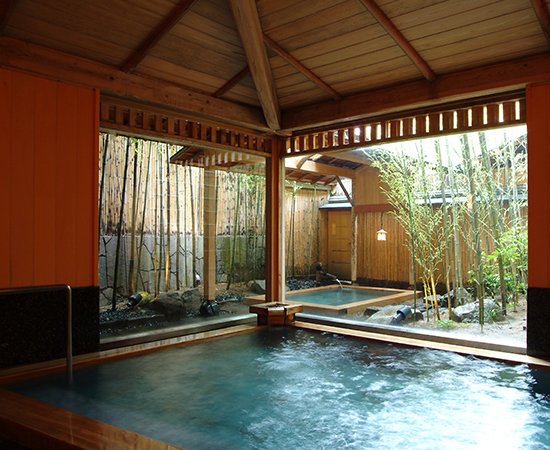 Bottom: There are three large communal baths at Nishimuraya Honkan, including the Kichino-yu bath shown here. Kinosaki is famous for its crab. During the crab season from November to March, Kinosaki draws massive throngs of crab-seekers, eager for a taste. However, the area in which Kinosaki is located, known as "Tajima," is blessed not only with the sea, but also with the mountains and is quite close to the ancient capital of Kyoto. From ancient times, the most prized delicacies of the season have been gathered here, in the hidden area of Japan's Kansai region. The meals at Nishimuraya Honkan authentically transmit this culture. First, your eyes will jump to the dishes. Menu items are carefully placed atop each piece of dinnerware and both food and dish combine to create an ode to the four seasons that can be visually enjoyed. In spring, meals convey the feeling of fresh breezes blowing from the mountains and in summer, meals are reminiscent of a drift of cool air flowing across a riverbed. 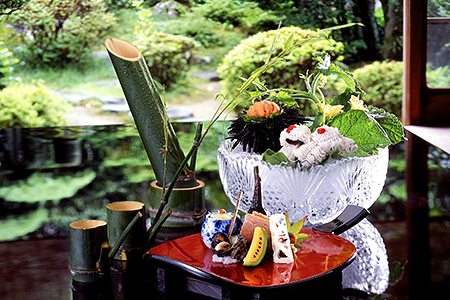 This culinary reputation is an important reason many guests come stay at Nishimuraya, through all four seasons. When the cherry blossoms are in vivid full bloom along Kiyamachi Street, in the middle of Kinosaki Onsen, the many riches of the mountain and sea can be savored. 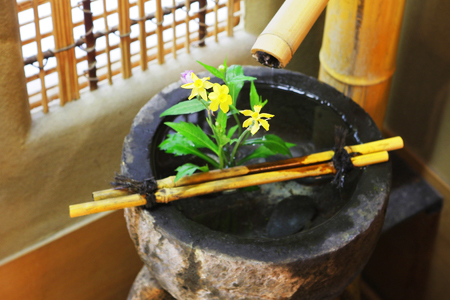 Edible wild mountain plants are abundant in the Tajima area, including young bamboo shoots, shoots of the Japanese angelica tree (so-called "taranome"), and warabi bracken. The seasonal catch is rich in a variety of rockfish, such as Japanese seabream, fat greenling, and Japanese red sea perch. These fish, with their succulent white meat, pair excellently with the fresh produce of spring. As Kinosaki Onsen enjoys close proximity to the Sea of Japan, seafood of the freshest quality is a distinct advantage of its local cuisine. Abalone, which exudes an aroma reminescent of the seashore, can be enjoyed as sashimi or grilled fresh in its shell. Locally-raised Tajima cattle, which is perhaps more widely known as the progenitor stock cattle of Kobe beef, Matsusaka beef, Omi beef, and virtually all other premium grade Japanese wagyu beef, is renowned for the finely marbled fat content and rich flavor of its beef. 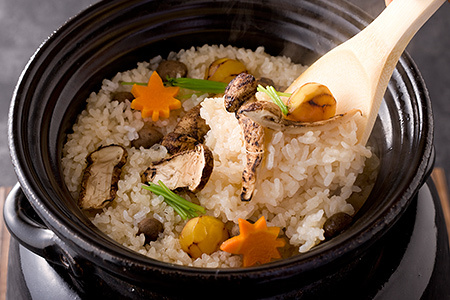 Matsutake mushrooms are an ingredient typical of the bountiful fall season and can be enjoyed in an array of dishes that bring out the best of fall's unique flavors, from steamed traditional-style in an earthenware teapot, to being served in one of its most popular forms--matsutake rice. Bottom trawling fishing is permitted from September in the Sea of Japan, bringing fresh snow crab, rosy seabass and various other bounties of the sea to the table. Crab, the king of seasonal winter cuisine, can be enjoyed for a limited time from November 7th to the end of March. 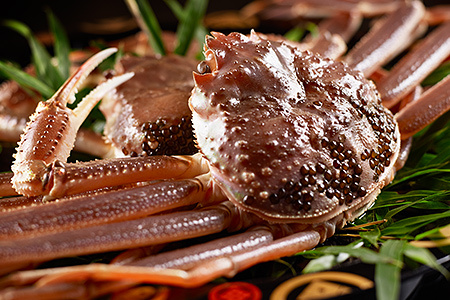 Matsuba snow crab is caught fresh at local fishing ports, such as Tsuiyama, Shibayama, Kasumi, and Hamasaka and can be enjoyed boiled, grilled over charcoal, or as sashimi. Profile: Head Chef at Nishimuraya Honkan since 2000. 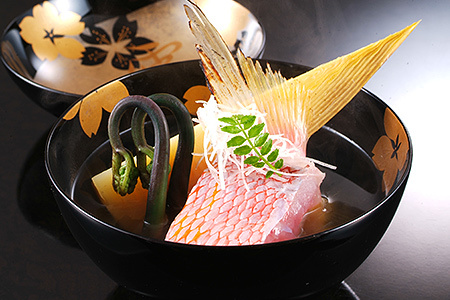 Since 2005, he concurrently serves as the head chef at Nishimuraya Shogetsutei, guarding the traditional flavors of Nishimuraya which have been passed down over one hundred and fifty plus years. In November 2012, he was responsible for producing the first-class in-flight meal menu for Japan Airlines. He has received critical acclaim with his commitment to fine cuisine, using the rich ingredients from the Tajima area such as Tajima beef and Matsuba crab. Since its opening, many famous individuals, including government dignitaries and prominent cultural figures, have stayed in the "Matsu" room. As most of these stays were private matters, evening banquets have also been served intimately in this suite room. When imagining them savoring their meals, all the while enjoying stunning garden views from the second floor, these famous people feel somehow familiar. 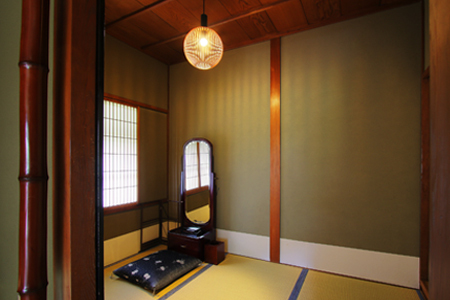 In the corner of the "Matsu" room is a small adjoined room equipped with a dressing table, which served as the ladies' dressing room. Geisha preparing to perform in the banquet have used this room to get ready for their dances. One can still feel remnants the splendor of bygone days in this historied space. 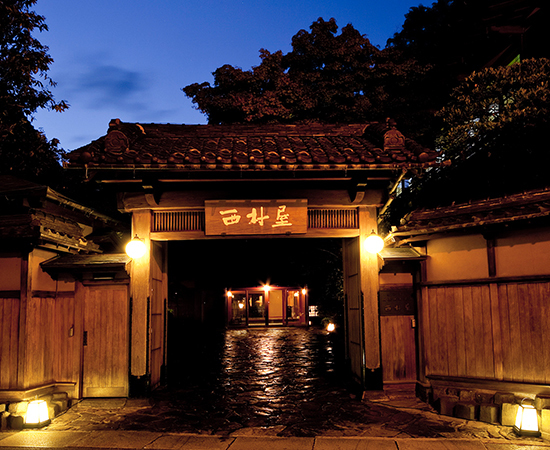 The famous Showa period kabuki actor, Nakamura Ganjiro II, often stayed in this room. 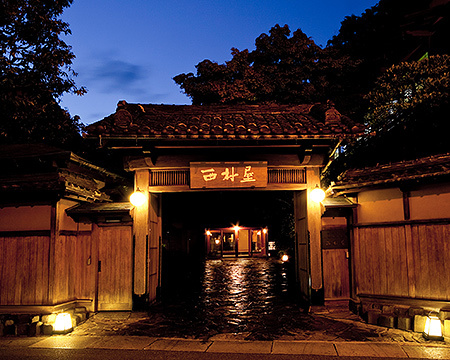 Ganjiro was renowned as one of the handsomest actors of his age; one can only imagine how romantic his nights here must have been. The interior of the "Matsu" room. 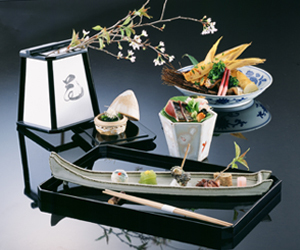 At Nishimuraya Honkan, meals are enjoyed from the comfort of each guest room--a traditional luxury in Japan. 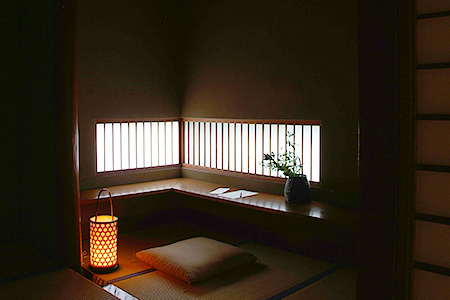 Top: The interior of the "Matsu" room. 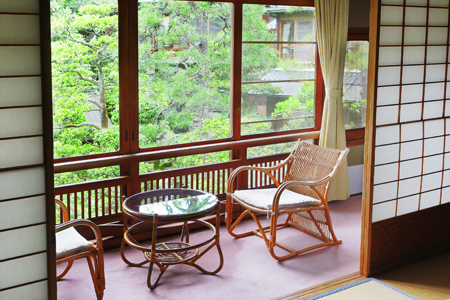 Bottom: At Nishimuraya Honkan, meals are enjoyed from the comfort of each guest room--a traditional luxury in Japan. There is a strange window above the stairs going up to the "Matsu" room. 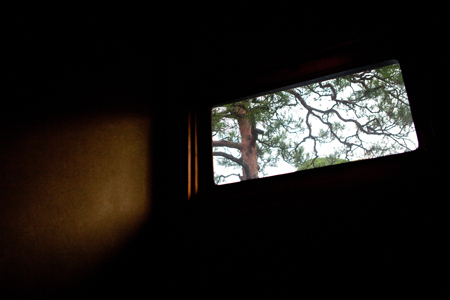 Befitting the room's name, which means "pine" in Japanese, a fine pine tree can be admired from this window. But if one are lucky, it is said that something very special can experienced here. Although it is a rare optical illusion to encounter, depending on the weather, at a specific time in the evening, a floating pine tree will appear on the frosted glass in the hallway, as if projected onto it. This phenomenon happens when the sun hits the window pain at a specific angle; it could be said that this may be one sign of the playfulness of the founder of Nishimuraya. A pine tree casts its shadow into the hall through a window. The Hiratakan annex building was designed by Masaya Hirata, a master craftsman from the Showa period who specialized in sukiya-style architecture. This building continues to capture the hearts of people who have an eye for finer things, even though it was built more than half a century ago. The rooms in the Hiratakan, built around a small miniature garden, are of course all unique. For example, one room on the first floor is built on a waterway that flows from the pond in the miniature garden. In autumn, maple leaves float atop the surface and lend a red appearance to the water. On the same first floor, there is also a room where the floor height is designed to be at ground level with the garden. In this room, it is hard to tell whether one is in a garden or in a room. A strange unity with the birds who visit the garden from time to time can be felt. 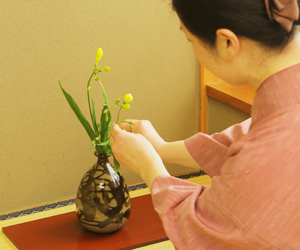 The Japanese saying, "Flower in mirror, moon on the water" ("kyouka suigetsu), which is synonymous with refined taste, comes to mind when it comes to the "Kangetsu" room. Meaning "moon viewing" in Japanese, the "Kangetsu" room particularly embodies this saying. From the window of this room, one can barely see any sky. However, upon peering into the miniature garden, and letting the eye wander past the foliage to still waters of the pond, a perfectly reflected moon can be spied and admired. 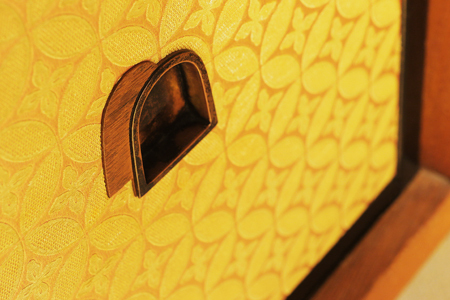 This eye for design epitomizes the height of Japanese refinement. A panoramic view of the Hiratakan annex. Top: A panoramic view of the Hiratakan annex. Bottom: A hallway in the Hiratakan. A small waterway flows adjacently. Regular guests often wonder at the fact that rooms are furnished with highly valuable objects rather too casually. 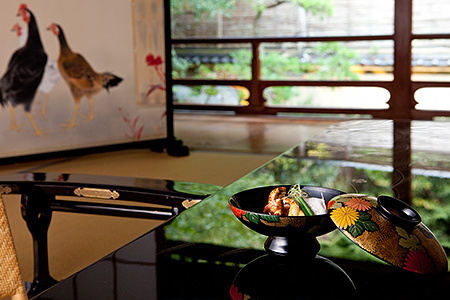 To be sure, some rooms do feature fine lacquer tables, or others do possess exquisitely painted screens--Nishimuraya Honkan is well aware of the value of these items. 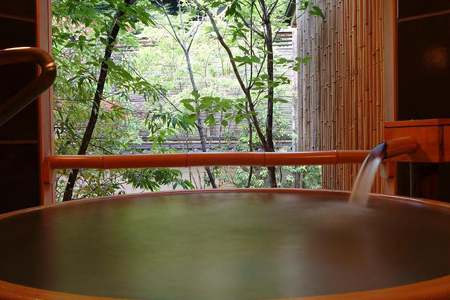 However, maintaining a warm, casual atmosphere is a constant mantra at Nishimuraya Honkan. Rather than allowing the atmosphere to be overcome with museum-like stuffiness, Nishimuraya Honkan prefers to treat these valuable items as ordinary objects. This in turn allows guests to not feel too concerned about the how valuable these fine items are. 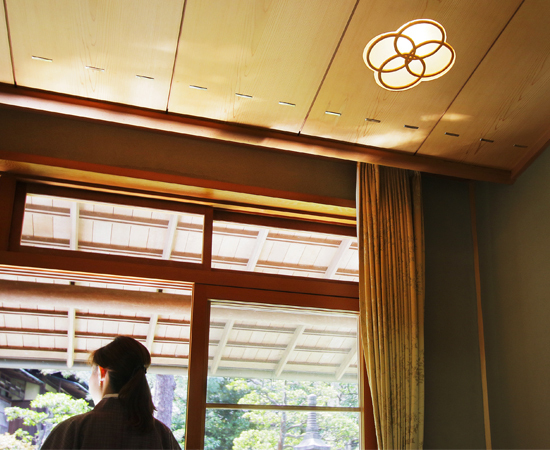 At Nishimuraya Honkan, guests can enjoy themselves without hesitation, even if visiting with children. This may be interpreted as the defining essence of the hospitality at this ryokan. Enjoy leisurely relaxation in the fresh verdure and pleasant breezes of nature. 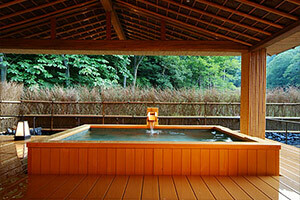 A hot stone sauna, a comfortable relaxation space, and a spacious open-air bath will take away any weariness. Enjoy sparkling wine in three kinds of luxurious spaces: Japanese, Balinese, and Chinese. Relaxation Salon Fuka offers luxurious spa treatments in an atmosphere that recalls scenes from Bali. The warm tones of the wooden interior and the gentle babble of a small stream soothe the spirit as relaxing aromas and faint melodies drift in the background. Let both your mind and your body be at peace in this tranquil environment. Information is current as of June 1st, 2016.